There was sporadic gunfire at the Federal High Court, Kano, yesterday. The incident occurred as the police confronted angry supporters of former governor Mallam Ibrahim Shekarau, former Minister of Foreign Affairs Aminu Wali, and former Director General of the Goodluck Jonathan Campaign Mansur Ahmad – all chieftains of the Peoples Democratic Party (PDP) in the state. The supporters in the thousands had tried to overpower the security operatives and force their way in. The police responded with sporadic gunfire. The officers extended the counter measure onto the premises, firing teargas canisters and sending lawyers, journalists and court staff scampering for safety. They also beat up people at sight, allegedly hitting them with rifles. He regretted the effect of the intervention on innocent people. On Wednesday, hundreds of protesters had also tried to prevent Shekarau from making his scheduled visit to the Kano State office of the Economic and Financial Crimes Commission (EFCC). Security personnel were reportedly forced to seek reinforcement to regain the upper hand. The All Progressives Congress (APC) currently holds sway in the state. The trio is facing trial on a six-count charge of money laundering, accused of collecting N950 million from former Minister of Petroleum Diezani Alison-Madueke, contrary to Section 18(a) of the Money Laundering Prohibition Act 2011 as amended. In his submission, prosecution counsel Johnson Ojogbane, who filed the charge, insisted the persons face three years imprisonment or a N10 million fine, and called for an open trial. 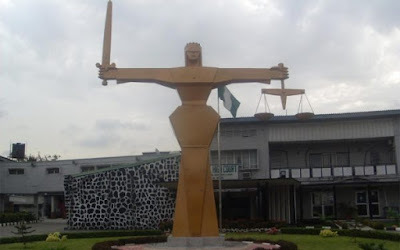 Counsel to the accused Sam Ologunorisa (SAN), who did not oppose the argument of the prosecution counsel to such trial, however, sought leave of the court for a bail application. Relying on Section 163 of the Administration of Criminal Justice Act, in a 10-paragraph affidavit, he insisted the offence was bailable. But the EFCC counsel opposed the application, maintaining the affidavit submitted was against Section 155 of the Evidence Act and that there was no such application before the court. After listening to the arguments, the presiding judge, Justice Zainab Abubakar, stood down proceedings for about 40 minutes. On returning, she granted the accused bail. The conditions include N100 million each; a surety with landed property within the jurisdiction of the court, and which property must have a Certificate of Occupancy and must be verified by the Ministry of Land and deposited with the court registrar; a second surety, who must be a civil servant not below the rank of a director. The accused were also required to submit their international passports with the registrar and two copies of recent passport-size photographs. Justice Abubakar maintained that granting bail is at the discretion of the court. She, however, ordered the accused to be remanded at EFCC’s custody, pending the fulfillment of the conditions. The case has been adjourned till June 26, 2018.